FA: Joe Denicola, Maki Grossnick, Karin Wuhrmann, Greg Barnes, July 2008. 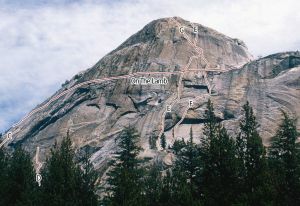 Climb the big left-leaning dike on the left side of Lamb Dome. Steep golden climbing up a pumpy rail to a thin crux leads to a huge flake and great knob climbing. The bolted belay is shared with an old 5.10 R/X route, Lamb Chops, which climbs sharply left-to-right. The second pitch leads up and left on golden slab to the heavily featured dike, and ends at the bolted belay of another 5.10 R/X route, Hip Boots, which came in from the left and then continues up the upper part of the dike with a substantial 5.10 runout. Rappel the route with a single 60m rope, which requires swinging over on the second pitch, and be careful to stay to the right when rappelling the first pitch. When dropping the rope on the first pitch, coil the rope and toss it instead of just letting it fall down the slab, since it’s easy for it to snag in the big detached flakes. Which SuperTopo guidebooks include a topo for Tooled?